The long-awaited report of President Trump’s Task Force on the future of the Postal Service was released Dec. 4, months after its original August deadline. While the task force stopped short of proposing an immediate, full-scale fire sale of the Postal Service, it’s no wonder the White House held the report until after the midterm elections – its recommendations would slow mail service, stop the Postal Service from innovating and would, indeed, privatize vast swaths of the Postal Service’s operations. On Dec. 4, 2018, the U.S. Treasury Department released the long-awaited report by the White House’s Task Force on the United States Postal System. The Task Force was created by an executive order issued on April 12, 2018. It was chaired by the Secretary of the Treasury Steven Mnuchin, with the Director of the Office of Management and Budget (OMB) and the Director of the Office of Personnel Management (OPM) also serving on the committee. This task force report followed a June 21 recommendation from the White House Office of Management and Budget, which called for the wholesale privatization of the USPS, i.e. selling it to private corporations. 11/28/2018 - For 37 days, members of the Canadian Union of Postal Workers (CUPW) engaged in militant rotating strikes in the struggle for a new union contract. 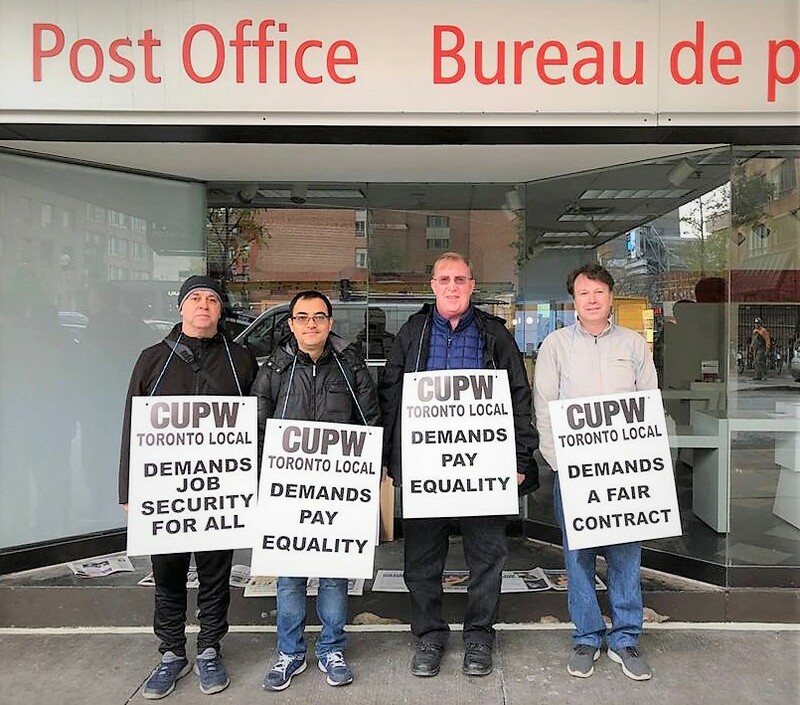 Canadian postal workers were forced into strike action by the refusal of Canada Post to address the just and urgent demands of the workers, including addressing dangerous work conditions and high injury rates, unequal pay for rural workers, and massive hours of forced overtime. Yesterday, Nov. 27, the Canadian government, through legislative action, forced Canadian postal workers back to work and into binding mediation and arbitration. Watch and Share our New Ad: The US Postal Service - Keep it. It's Yours! 11/16/2018 - We’re ramping up our campaign to stop the White House’s proposal to sell the USPS to private corporations — and we’re asking every APWU member to join the fight. We partnered with the National Association of Letter Carriers to produce a new ad to spread the word about the consequences of a postal corporate takeover. Will you watch it and share it with your friends to help us tell the White House that the U.S. Mail is Not For Sale? Click here to watch the ad! Read more about Watch and Share our New Ad: The US Postal Service - Keep it. It's Yours! “We won’t let the postal eagle be replaced by the vulture.” What a great response by Legislative Grassroots Coordinator Janice Kelble to the White House of Office Management and Budget (OMB) proposal to sell-off the Postal Service to corporations for private profit. The eagle symbolizes that the public Postal Service belongs to, and serves, all the people. The vulture represents those who want to pick the public good apart and devour it for private Wall Street greed. Read more about Eagle or Vulture? Following nearly a year of negotiations with Canada Post, the Canadian Union of Postal Workers (CUPW) began rotating strikes across the country on Monday, Oct. 22...CUPW’s membership of 50,000 overwhelmingly authorized a strike action following a vote in September. Over the last two years, massive increases in parcel volumes contributed to workplace injuries increasing by 43 percent. What can you do? APWU members are encouraged to print off one of the CUPW’s signs, take a pictures of you – and your co-workers if possible – holding the sign(s). Post the image to Facebook, Twitter, or Instagram with a message of support and tagging CUPW and #negos2018.